10 clever Hacks to ensure a pocket friendly budget Indian wedding! Wedding extravaganza is a real thing and I think we can easily lay the blame on Yash Raj and Karan Johar. The wedding game has changed since the late 90’s, so much so that now it’s a full fledged industry. Loads of functions, elements and tension. It might seem like an impossible task, but there are a few tips and tricks in order to cut down your overall cost. Take a deep breath, sip on your green tea and read all the hacks you must know in order to fit your wedding in a budget! Okay I agree you wish to dress up like Rani Padmavati did everyday, but hon, is it really worth spending lakhs for an outfit that you’re going to wear only on one day? Instead hop down to Chandni Chowk and you’ll find a treasure trove full of Sabyasachi, Anamika Khanna and Manish Malhotra copies! Non delhi brides, I am sure a trip to delhi will be cheaper than a Sabyasachi lehenga! Jokes apart, it’s always better to source a lehenga from your city’s bridal market. Or you can always rent it from Flyrobe. The bridal jewellery often costs more than one’s kidneys (read:plural) It’s alright to invest in a light necklace or a wedding ring. However, renting jewellery for the D day is the best thing to do. Don’t be ashamed to rent it for it’s your wedding, not your extended family’s! In case you are wondering where to rent it from, well Flyrobe again comes to your rescue! Jab pura India digital ho raha hai, toh aap kyun nahi? Ditch the paper invites and go for the digital invitations. It’ll save your time and money! Forward the invitation to your friends and family and your work is done! 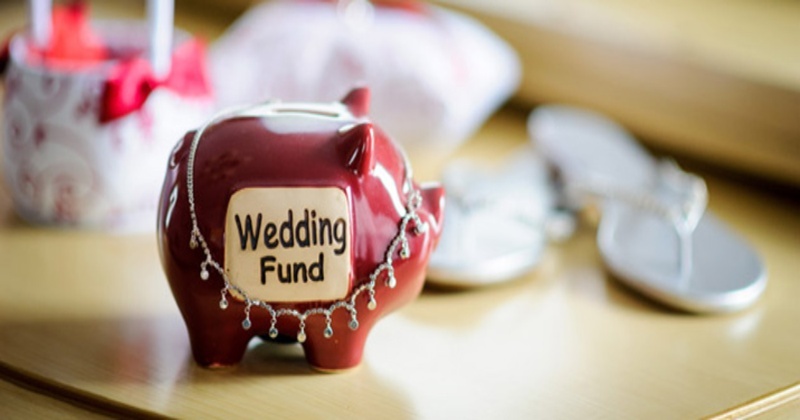 The wedding date plays a huge part in your budget. If you plan to get married during the off season, you’ll have plenty of options and cheaper rates as venues tend to slash the rates and offer huge discounts. This also means your functions don’t clash with some other friend’s! Tough choice, this one! A wedding should be an intimate affair with only your near and dear ones to witness the eternal moment. There is no need to invite your dad’s fufa’s neighbour’s dog to your wedding! Keep the guest list to a minimum, you’ll save yourself some money and headaches! Nowadays if a wedding doesn’t have 78 different cuisines, it’s not considered “good enough”. Ek insaan kitne hi cuisines khaa sakta hai! Opt for 1-2 cuisines with maximum 8-9 dishes in each. Save food, save money! Fancy shancy venues are so last year. Try an offbeat place such as a huge library, garden, open spaces, etc. Any place that holds a special memory sounds perfect! In case you are confused about where to book your venue, reach out to us here, we will help you out! It’s absolutely not necessary to have a mehendi, haldi, chuda, sangeet, etc etc. Combine all the functions into one! Set performances for the mehendi and take Youtube tutorials help instead of hiring a choreographer. Haldi and chuda can be held at home. The decor rates are insane at the moment! Floral decor cost minimum a lakh! You can make instagram worthy props at home with the help of the 100 cousins that you have. Keep it humble and pretty! Check out these DIY wedding decor ideas for your haldi and mehndi functions! Discount maangna humara janmsiddh adhikar hai! Our moms have taught us the art of bargaining well. Play your strengths and shamelessly ask for discounts everywhere possible! Use what your momma gave you! Now do you believe when I say that it’s possible to have a wedding in a tight budget? Psst...it’s also possible to have a cheap international honeymoon..check out our blog to know more!